What do passengers find truly icky? What prompts a collective “ew”? DSB’s cleaning crew needed pointers on how to prioritize and target the ‘right’ dirt when cleaning platforms and trains. We followed DSB’s cleaning crew on their daily routines, to understand if their assigned priorities matched up with those of the passengers. We explored how the human experience of cleanliness affected the overall experience of a service. We figured out what riders truly care about and created a tool with corresponding standards for the DSB crew to use. Cleanliness is not just something you see; context matters. Puke on the platform floor on a Tuesday morning is much worse than its presence on Saturday night. 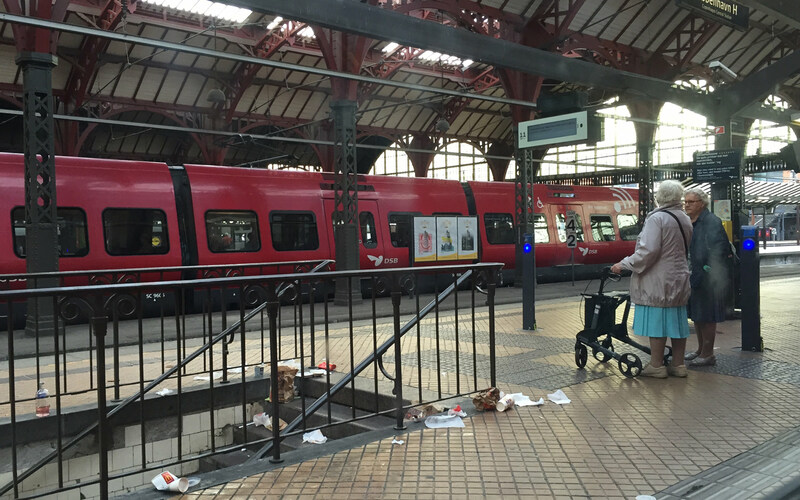 Danish Railroad Company (DSB) approached us with a challenge: they were about to outsource their cleaning service, but did not know how to rate the efficiency of the service from either a passenger perspective or a professional cleaning perspective. Unaware of how train passengers perceived cleanliness, DSB was unable to define criteria for success and therefore wanted insights on how to create standards for how to measure the cleanliness on their public trains. Prior to our study the cleaning staff were instructed by a primarily visual manual that provided examples of poor and high cleaning standards. For example, the optimal cleaning of a waste-bin was presented visually through three steps of cleaning – and so on for all parts of the train setting. In this manual every area of the train and stations were equally prioritised, and the same cleaning standards were in place throughout the week. As we proceeded with our research, it soon became clear to us that DSB had a very static and broad cleaning approach. We discovered how passengeres experienced their journey through every sense, and the station context, time of day and week also had a role to play. Mess such as puke or rolling beer cans on a Saturday evening at Nørreport were judged far less harshly than on a Tuesday morning in Randers. Sticky floors, wet table surfaces and smelly elevators topped the criteria of unpleasantness whereas grafitti and newspapers did not really bother passengers. DSB were actually not priotising their cleaning service in the areas that meant the most to the passengers and some aspects were not even included in their ranking tool. Participant observation in the train setting provided us with a nuanced understanding of the nature and level of influence that cleanliness, dirt and trash has on the social, physical and emotional experience. Finally, ethnographic interviews with commuters on board the train allowed passengers to elaborate on their perception of what a ‘clean journey’ is. Digital ethnography stood out as a particularly valuable tool. Passengers first documented the factors that affected their overall experience and then focused on documenting the dirt and trash on board trains and in station areas. The overlaps and discrepancies in the trove of pictures, video footage and anecdotes from commuters in the train setting provided sufficient data for us to develop a ranking tool. We realised it was important to view the experience of cleanliness as a multisensorial, contextual matter rather than a purely visual or static one. We identified three crucial factors that threaten the overall customer experience of cleanliness and comfort on board trains and in stations. Interestingly, we found that while today DSB mainly focuses on eliminating visually perceived and dry dirt, customers pointed out that the experience of smells and wet dirt overrides that of dry clutter and dominates the perception of cleanliness. Smells infiltrate your personal space, which is one of the main aspects of comfort on board the train. In other words: if it smells clean, it feels clean. Based on a more nuanced understanding of what is perceived as dirty or pleasant we developed a ranking tool the staff could use to prioritize and monitor underperforming areas. This empowered DSB to take action in areas that affect the overall customer experience.